For those of you Blazer Maniacs out there with an Apple iPhone or iPod Touch, you are likely as obsessed with applications for them as I am. As my fixation grows, I decided to see what the world had to offer for Blazers related material…the outcome was pretty grim. 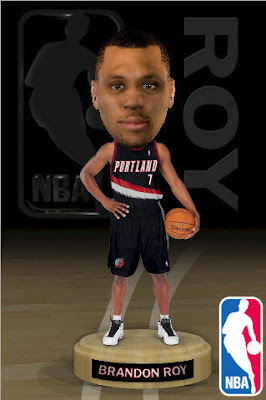 I did find a few, but nothing extremely fulfilling aside from this creepy mini-bobblehead of Brandon Roy. (Which of course is bobble-able just by shaking your little iPhone around.) Neat. Pretty self explanatory isn't it? An application that gives your screen a mini-bobblehead which you can shake around and laugh at the creepiness of it for about 5 minutes. Luckily it's only $0.99 because another penny more would have made this a ripoff...or something. Basically gives you a special application dedicated to the Blazers. It populates a news feed with the latest Blazers news, standings, playoff news, and stats. Probably worth purchasing just to have it all in one place. Ummm...yeah. This would be the schedule at your fingertips. Sounds like some Blazers-worthy programmer needs to get their little keyboard fingers dirty and whip up something special for us all to download. It’d be a goldmine I would think. (And now I ponder the idea of making some chincy iPhone app.) Oh and by the way, none of those are affiliate links or anything dirty like that; just direct links to the app if you want them. That schedule link didn't open up in itunes (on my iphone). A search for 'blazer schedule' didn't turn up anything in it either. Link broke or is there another avenue to procure a schedule app?